In the wake of a white supremacist rally in Charlottesville, Virginia Saturday, protesters gathered at Denny Park and marched to Westlake in Downtown Seattle yesterday to confront a right wing group called Patriot Prayer. On their way, however, protesters encountered human barricades of police, canisters of pepper spray, and flashbangs. The event, though scheduled before recent tragedies, took place the day after white supremacists and Nazis gathered en masse in Charlottesville, Virginia and killed one counter-protester, Heather Heyer, while injuring others. Protesters initially gathered in Denny Park and, once they reached a good 1,500 or so, headed toward the Patriot Prayer rally. The protesters were blocked at 2nd Avenue and Pine Street, however, by police. 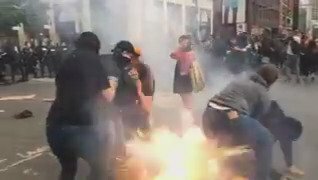 The Seattle Police Department decided their tactics for that evening were to prevent protesters from reaching Patriot Prayer supporters. It is true that SPD has recently been changing tactics with potentially clashing groups since the Milo Yiannopoulos event and protest at the University of Washington on Jan. 20 that left many wounded from brawls and Joshua Dukes shot. At that event, police held the line around the perimeter of the crowd, letting brawls clash below and pepper spray exchange between supporters and protesters. Since then, and after much scrutiny, SPD has decided to take the tactic of bicycle barricades often between opposing parties. This time, however, it was taken a step further by preventing one group from advancing to their free speech destination altogether for quite some time. In addition, Gibson explained in a live video posted to Facebook late Sunday night that SPD set up the metal fence barricades around the Westlake stage before Patriot Prayer arrived. Protesters did eventually reach Westlake Park. Upon arrival, much of the time was spent yelling boos and flipping the bird. Gibson didn’t understand why the crowd booed a woman who got on stage selectively reading Martin Luther King Jr quotes that appeared to condemn protests. Gibson thought she was receiving boos simply because she was White and reading MLK Jr quotes. At one point, two men took the stage behind Gibson. One shouted Black Lives Matter into the side of a mic-holder’s face and then turned to urge the crowd’s chant. He was successful, and he was visibly strained. The two men then raised clenched fists. Their names: Arthur Ford, aged 23, and Mario Cater. Gibson then expressed they could talk and later asked others if they wanted to come up and speak as well. Ford was answering a Patriot Prayer crowd member. He then explained it has to do with government labeling people. He explained society acts like one black person’s actions define every black person. Later, a Patriot Prayer crowd member turned to Walter Olebar, who stood behind the metal fence wearing all red clothing, and called him a gang member. Ford and Cater, having descended from the stage at this point, stood next to Olebar and challenged the Patriot Prayer supporter directly. The accuser said he doesn’t have tattoos because he can’t afford it. “I’m poor,” he said, shrugging. Eventually the accuser said Olebar wore a gang color and that he matched. Ford didn’t hesitate. Pointing at the accuser’s and other people’s clothing he said everything was a gang member color. The accuser said he ran into a guy on the sidewalk some time ago who proclaimed himself a gang member. “Just because you met one idiot doesn’t mean he’s an idiot,” Ford replied. Both Ford and Cater were getting pretty upset at this point, and began leaning in and gesturing with their hands as they talked. The accuser then bellowed, “Hey! If either of you put your hands in my face I will fight you!” There is however some discrepancy whether he said “bite” or “fight.” A woman standing aside then began putting up her hair into a ponytail and stepped in between the parties, telling the accuser he needed to leave. This was Tracy Molina. Initially she wasn’t going to attend the protest because she has attended many and feels they’re all the same. However, after the events in Charlottesville, Virginia, she changed her mind. She expressed that those present for the Patriot Prayer rally didn’t understand hate groups intertwine for these events. Molina mentioned specifically Proud Boys and Evropa. She mentioned that these types of groups disrespect those who fought in WWII. Every generation in her family served in the military, including herself. Charlie Wilson, an iron worker, held the same sentiments. Although clad in suspenders and American flag colors, he carried a sign saying “F— off Nazi scum.” When he’s not working, he tends to engage in political activism. A Sen. Bernie Sanders voter, Wilson expressed that he’s lost respect for Democrats. Wilson expressed that he had to fight to keep his sign. He wasn’t the only one. Jacob Hays walked down the sidewalk carrying a “buds not bombs” sign, but was quickly swarmed by three SPD officers in riot gear. They questioned him and said his sign was a weapon and he’d have to leave it behind. The sign, however, has been around for quite some time and wasn’t an issue at other protests. Hays is the very person, with the same sign, captured in a Seattle-famous photo sharing weed with young, bald, neo-Nazi Kyle Broussard at a pro/anti-Trump rally. The sign, Hays said, is one he’s had since 2014 and is made from a broken piece of his backyard fence. To get past the officers, he threw it in the trash. Other “weapons” SPD confiscated included a sign with plastic PVC pipe as handles, a 2×4 piece of wood with screws in it that held together a replica sign but was broken, and a funny-shaped stick. SPD officer T. Duennes, one of the three who said Hays’ sign wasn’t allowed, could only explain that officers were vaguely instructed to confiscate anything that could be a weapon, and it was essentially up to each officer’s discretion what that entailed. Duennes couldn’t quite articulate why that sign was more dangerous than the thousands of other signs already present. Someone else had more of a tussle with police. Nicole Calvin said she was walking to Westlake Park when she was pushed to the ground by a female police officer with a bike. The officer then reportedly held Calvin down but was pulled off by a Sergeant who rushed over. Calvin had fresh scrapes on the tops of her feet that were bleeding and her wrist was swollen. Spring Pinkney simply came out to see the event, went back home to tell everyone, and then ran into the opposing rally. Her daughter joined the latter, and Pinkney was scared for her so she came back. “When the cops came out with those long sticks and everything, I got scared,” she said. Pinkney also expressed the moment SPD threw flashbangs and pepper sprayed protesters at 2nd Avenue and Pine Street. One of Gibson’s followers reported that their tires were slashed by the end of Sunday’s events. SPD announced three people were arrested and there were no injuries. Gibson’s next event for Patriot Prayer will be in San Francisco.